In this elegant study, Tecuapetla et al. present the most direct evidence that ventral tegmental area (VTA) dopamine (DA) neurons mediate glutamatergic cotransmission. Their results build on our recent conditional knockout studies showing that deletion of vesicular glutamate transporter 2 (VGLUT2) from DA neurons eliminates fast glutamatergic responses recorded in the mesoaccumbens slice preparation . 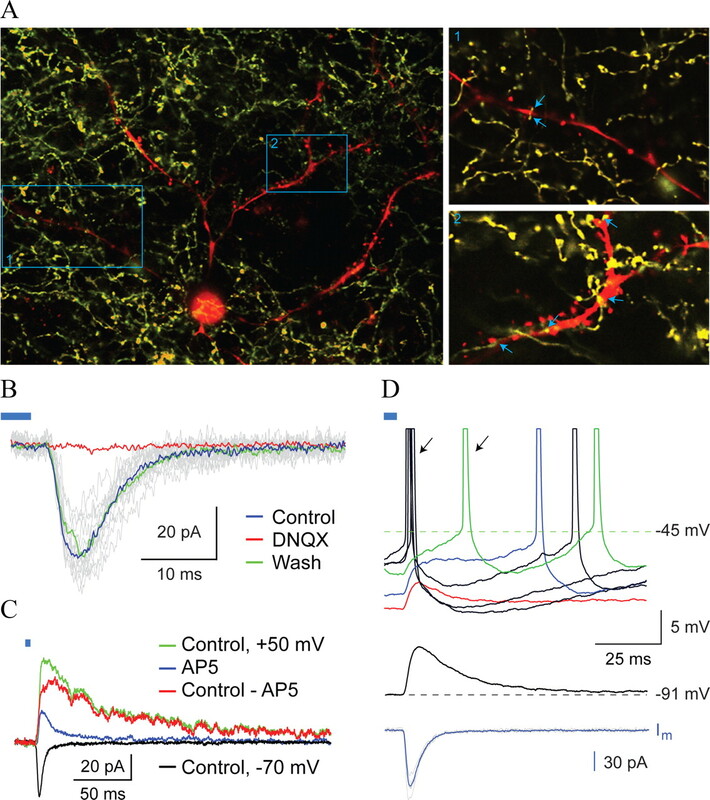 Their recordings from axonal blebs provide crucial presynaptic access, confirming reliable photostimulation, and that the glutamatergic responses arise directly from DA neuron axons. Remarkably, they find glutamatergic responses in every spiny projection neuron recorded, indicating that glutamatergic cotransmission is a fundamental component of the mesolimbic DA neuron signal. We would, however, counter their argument that they are observing a different response from the VTA DA neuron glutamatergic response (VDNGR) we observed [2, 3]. They base this on their observation of temporal depression of repeated light-evoked responses that appears to be at odds with our previous observations of temporal summation of the VDNGR , and so argue that we are observing contributions from non-DA neuron glutamatergic neurons. Their recordings were, however, apparently made with a Cs+ containing intracellular solution (they refer the reader to their previous paper for the methods for their slice recording ), and indeed we observed depression in our recordings with a Cs+ containing intracellular solution (see Figure 4A1 in our previous paper ). So based on this, there is in fact no discrepancy: we are both reporting on the same VDNGR. Even if Tecuapetla et al. did their recordings with a K+ containing intracellular solution, there are several further reasons for the discrepant results regarding summation, independent of invoking other glutamatergic inputs. We recorded from younger animals, so the recognized maturation-related down regulation of VGLUT2 expression  could account for a weakening of the glutamatergic signal and a maturation-associated switch from temporal summation to depression. While recording from blebs provides crucial presynaptic access, it does raise concerns about the health of their synaptic recordings. The presence of blebs clearly indicates that the photostimulated axons were injured; moreover the recorded cells must also be in superficial layers of the slices and thus may also be injured. We routinely see fluorescent DA neuron axon blebs in our DAT-EYFP mice, but not until slices have been incubated for several hours, raising further health concerns. If their photostimulated axons were not that healthy, one might well expect to find temporal depression rather than facilitation. Moreover, our new conditional VGLUT2 data (which were not published at the time their paper was resubmitted) indicate that the VDNGR depends on VGLUT2 expression in DA neurons, clearly demonstrating that the VDNGR reflects DA neuron glutamate cotransmission . Thus, we would discount the temporal depression vs. summation argument and conclude that we are both studying the VDNGR. While Tecuapetla et al. discuss the role of glutamate cotransmission in terms of fast signaling of dopamine neurons, with which we certainly agree , there are at least two other roles to consider. In our recent conditional VGLUT2 knock out report , and in a second recent conditional VGLUT2 knockout report , DA neuron conditional VGLUT2 knockout mice respond less to psychostimulants; this appears to be due to the loss of VGLUT2-mediated enhanced packaging of DA into synaptic vesicles , in what el Mestikawy has termed vesicular synergism . Descarries and Trudeau  have proposed that during development glutamate cotransmission in monoaminergic neurons is crucial for their wiring. Thus, DA neuron glutamate cotransmission appears to have several, possibly synergistic roles. 1. Hnasko, T.S., et al., Vesicular glutamate transport promotes dopamine storage and glutamate corelease in vivo. Neuron, 2010. 65(5): p. 643-656. 2. 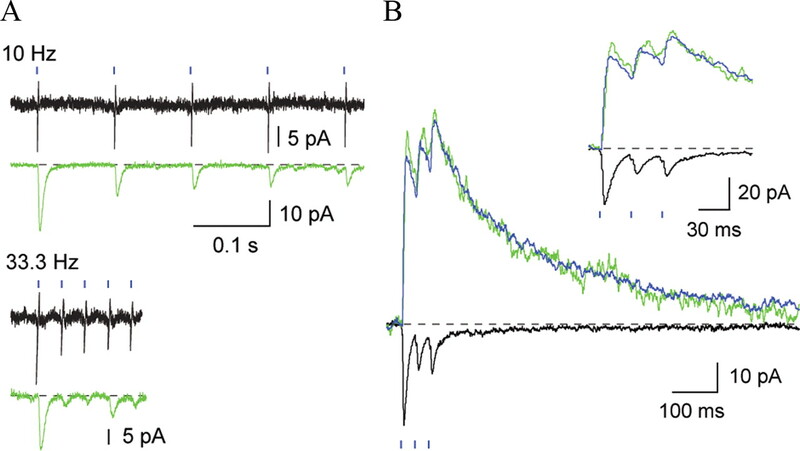 Chuhma, N., et al., Dopamine neurons mediate a fast excitatory signal via their glutamatergic synapses. Journal of Neuroscience, 2004. 24(4): p. 972-981. 3. Chuhma, N., et al., Dopamine neuron glutamate cotransmission: frequency-dependent modulation in the mesoventromedial projection. Neuroscience, 2009. 164: p. 1068-1083. 4. 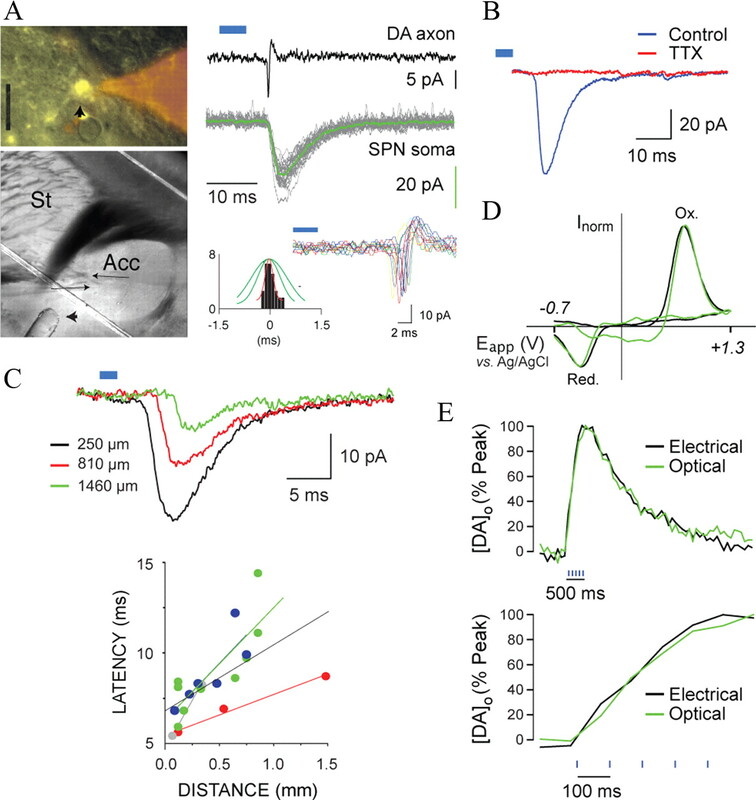 Tecuapetla, F., et al., Differential dopaminergic modulation of neostriatal synaptic connections of striatopallidal axon collaterals. Journal of Neuroscience, 2009. 29(28): p. 8977-90. 5. Descarries, L., et al., Glutamate in dopamine neurons: synaptic versus diffuse transmission. Brain Research Reviews, 2008. 58(2): p. 290-302. 6. Birgner, C., et al., VGLUT2 in dopamine neurons is required for psychostimulant-induced behavioral activation. Proceedings of the National Academy of Sciences of the United States of America, 2009. ePub 14 Dec.
7. Gras, C., et al., The vesicular glutamate transporter VGLUT3 synergizes striatal acetylcholine tone. Nat Neurosci, 2008. 11(3): p. 292-300.